The Tibetan Machine Web font is a web-viable, cross-platform True Type font, created by Tony Duff with the assistance of the Tibetan and Himalayan Digital Library. It reorganizes the Tibetan Machine font characters so as to permit cross-platform exchange and Internet display capability. The font consists of ten True Type font files. These font files use a single byte ASCII encoding with the capability to hold 256 characters. As there are over 1,000 glyphs needed to represent Tibetan in a digital environment, a single ASCII font is not enough. 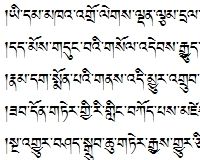 Thus, it is necessary to use multiple font files to fully display Tibetan script. This font was important historically, since many used it in the 2000s during a transitional period prior to the full implementation of Unicode. It has now been largely superseded by the rise of Unicode fonts. Tibetan Machine Uni is an excellent Unicode font based on the Tibet Machine typefaces for those who want the look of Tibet Machine but desire to work in a Unicode environment. Although there are 256 spaces in a True Type font, certain codes, generally below 33 and above 126, are often reserved by the computer's operating system for control keys. While the lower encodings have a standard set of assigned characters, the encodings for control keys in the upper half of the ASCII set differ greatly according to the operating system. This prevents a font that uses the upper half of the ASCII character set from being transferable across platforms, as well as interfering with displaying the font over the internet. The Tibetan Machine Web font rectifies this problem by creating a set of ten fonts that only use the lower half of the ASCII register, which is the same across the Windows, Mac, and Linux operating systems. Therefore, it functions on all three platforms and can be displayed in the most common browsers. Thus, Tibetan Machine Web is a modification of Tibetan Machine to use only the lower ASCII register. This was achieved in essence by splitting each of the Tibetan Machine font files in half. There is therefore a rough correspondence between the two fonts. The first two Tibetan Machine Web font files contain the standard Tibetan glyphs and roughly correspond to the first Tibetan Machine font file. The third and fourth Tibetan Machine Web font files roughly correspond to the second Tibetan Machine font file, and so forth. The description of Tibetan Machine Web's character set is found within the detailed documentation for Tibetan! 5.1, the Tibetan text editor developed by the font's creator, Tony Duff. While much of the material in the documentation for Tibetan! 5.1 is specific to that program, it also includes a general description of Tibetan fonts as well as an appendix (Appendix III) with all the technical information, needed by developers. This appendix includes both a chart of glyphs in each of the ten font files as well as a separate chart giving a list of glyph names, their Tibetan character, their ASCII encodings, and the encodings for the complete range of combining vowels associated with each character. Because of the extensive nature of this documentation, it has been included here as a separate download for those with a desire to learn more about Tibetan fonts and/or developers who need to know the font's technical specifications. This documentation is a PDF file that can be either viewed over the internet or downloaded onto one's computer. In either case, the Tibetan Machine font must be installed on one's computer to view the documentation file properly!